Consider how this compares to basic human needs: breathing air in and breathing out, eating food, drinking water, and getting rid of urine/stool. When you really stop and think about it, many of the things that we do can be traced back to our cellular needs. Now let’s follow a single breath of air. 21% of the molecules in this breath are oxygen molecules, and as they race down into the lungs, they end up in the alveoli which are tiny air-filled sacs. The story could end there, if not for the remarkable nature of lungs. 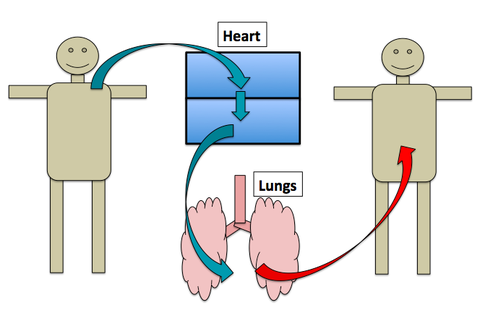 The lungs allow the oxygen molecules to continue their journey from the gas phase into a new liquid phase. Meanwhile carbon dioxide molecules make the opposite trip from liquid to gas similar to what happens at the surface of a carbonated beverage. The oxygen diffuses (think of the drop of ink in a pool of water) into the fluid interstitial space of the lung, and is then absorbed into the blood stream, and then enters into the red blood cells themselves. 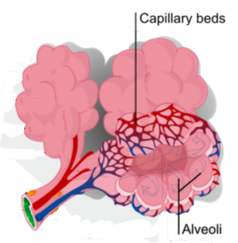 This diffusion occurs in a fraction of a second because the distance between the alveoli and the red blood cell is so tiny. What would happen if there was no heart? Well, diffusion of oxygen works wonders when the distances are very small, but what about large distances like the distance from your lungs to your feet? Could a single molecule of oxygen simply diffuse all the way there? In theory, it could—but it would take a really long time! By the time the oxygen arrived in your toes by simple diffusion, they would have died and fallen off. Once the oxygen has gotten into the blood stream, there has to be a way to rapidly “move” the oxygen molecules from one place to another. This is where hemoglobin, a protein that uses iron to help bind to O2 molecules, comes to the rescue. Each red blood cell is filled with ~250 million hemoglobin proteins, and each Hemoglobin protein can bind to 4 O2 molecules (the bound form is called “oxyhemoglobin”). That means that each red blood cell can bind ~1 billion oxygen molecules! As a result, the vast majority (>97%) of the O2 molecules are actually bound to oxyhemoglobin; with only a minority of O2 molecules floating freely in the blood. While air is going in and out of the lungs, the heart is busy working as well. Blood enters the heart through the superior and inferior vena cava, which are the large veins that bring blood back from the top and bottom of the body respectively. Then, the blood remains in the right atrium, which can be thought of as a waiting room for the right ventricle. The right ventricle (pump #1) has muscular walls that squeeze down and softly push the blood into the arteries, arterioles, and capillaries of the lungs. 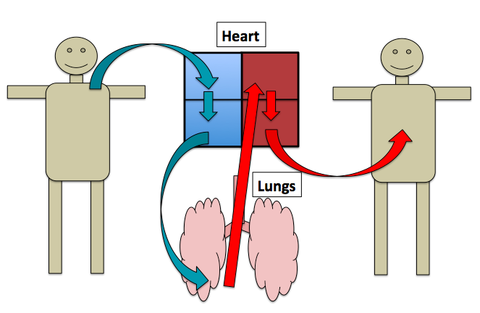 Next, the oxygen diffuses from an area of high concentration (alveoli) to an area of low concentration (blood), before the blood returns (through pulmonary veins) to the left of the heart. Just like the right atrium, the left atrium can be thought of as a waiting room for the left ventricle. The left ventricle is a room with even stronger, thicker, and more muscular walls than the right ventricle. As a result, the left ventricle (pump #2) forcefully pushes the blood through the arteries and capillaries of the body to get to the trillions of cells in need of oxygen. For the return trip, blood travels through the veins of the body to get back to the right side of the heart and repeat the process. 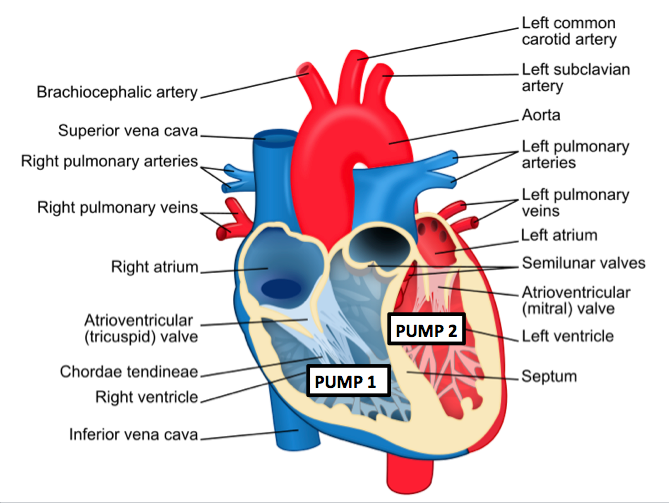 So there you have it – one heart – two pumps: the right ventricle and the left ventricle. Why are there two ventricles? Now here’s a thought experiment: Why not just have just one ventricle (single pump) that moves blood to the lungs and then onwards to the rest of the body? The heart functions as a double ventricle. Blood moves from the body into the right atrium, and then into the right ventricle where it gets pumped into the lungs. Blood gets oxygenated in the lungs, moves into the left atrium, and into the left ventricle where it gets pumped into the body again. This diagram shows the heart as having a single atrium and single ventricle. Blood moves from the body into the atrium, and then into the ventricle where it gets pumped into the lungs, gets oxygenated, and then goes back to the body again. It’s actually a great question, since at first glance it seems like it would be more efficient to just allow the blood to go out to the body instead of taking a return trip to the heart. Think of it this way using numbers. Pressure is needed to move blood through the resistance of a large network of blood vessels like arteries, capillaries, and veins. Even if the right ventricle squeezes down and raises the pressure of the blood to about 25mmHg, after passing through the lungs, the blood pressure is back down to about 5mmHg (a reduction of 20mmHg). It goes into the left ventricle where it gets a second squeeze causing the pressure to rise back up to about 120mmHg (almost 5 times the pulmonary pressure!). That’s enough pressure to make it through all of the organs in the body. Now, let’s say that the right ventricle raised the pressure up to 140mmHg, then you may be able to have the blood pressure drop 20mmHg and still be at 120mmHg. That sounds like a great solution, except for the fact: 1. If exposed to those high pressures, fluid would get pushed right out of the capillaries and into the lungs (some capillaries would actually break! ), and 2.At high pressures, blood would move past the alveoli so quickly that O2 molecules wouldn't have time to diffuse into the blood and bind to hemoglobin. This makes sense when you remember that none of the capillaries in the body are exposed to extremely high pressures (120-140mmHg), because by the time blood gets down to the capillaries it has already passed through arteries (and arterioles), and the pressure has dramatically fallen. Having lower pressures in the pulmonary circulation is particularly important given the large amount of O2 that needs to diffuse across from the alveoli to the capillaries—every extra millisecond helps! That’s why the human body needs two pumps working at different pressures, high pressure to allow the blood to circulate around the body, and low pressure to allow for optimal gas exchange in the lungs without broken capillaries!